Brown Mustard (Brassica Juncea) other names : Brown Mustard , Chinese Mustard , Indian Mustard , Oriental Mustard , Russian Mustard , Sarepta Mustard. People have been growing mustard for more than 5000 years for their beneficial seeds. 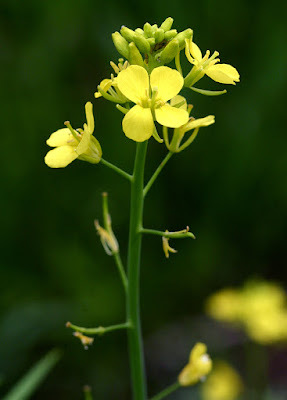 While the white mustard is indigenous to the Mediterranean region, North Africa and central Asia, brown mustard (botanical name Brassica juncea) has its origin in Asia. All varieties of mustards are annual plants, usually growing up to a height of 60 cm to 120 cm (2 feet to 4 feet). Both, the white and brown mustards also grow in the wild in the form of weeds. 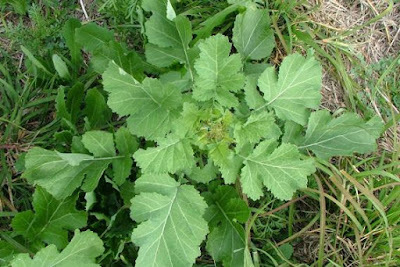 In fact, both white and brown mustards are basically seed mustards and ought not to be mistaken to be vegetable mustards, for instance, mustard greens. While even the leaves of the seed mustards are safe to eat, those of the vegetable mustards possess a better flavour. White and brown mustards possess a spicy flavour and have deep green, intensely cut lower leaves. On the other hand, the upper leaves of both these seed mustards are comparatively less divided, particularly in the case of the brown mustard. In the case of white mustards, both the stems and branches usually have hairs, while brown mustard is somewhat hairy. Both these varieties of seed mustards bear wobbly clusters of yellow blooms, which begin to blossom approximately five to six weeks after the emergence of the seedlings. Flowers of the white mustard are rather larger compared to the flowers of brown mustard. While the seed pods of brown mustard that form closely to the stem of the plant have a plump, cylindrical shape when mature, the seed pods of white mustard stick out from the stem and have an elongated, beak-shape tip. The seeds of brown mustard have a brownish or yellow hue and they emit a noticeably exasperating smell when they are crushed. On the other hand, the seeds of white mustard have a white or yellow color and they are odourless. Compared to the brown mustard seeds, the white mustard seeds have a mild flavour. The leaves, seeds and flowers of both the white and brown mustard are edible. Brown mustard plants thrive best in full sunlight, but also have a preference for some shade. Brown mustard is averse to extremely hot weather conditions. Brown mustard plants have the ability to endure very high rainfall and, while they are reasonably deep rooted, they are unable to resist drought. Brown mustard is cultivated extensively for its edible seeds that are employed to prepare an essence called ‘brown mustard'. This condiment possesses just 70 per cent of the sharpness of the black mustard (Brassica nigra), however, brown mustard is possible to harvest the crop mechanically and, hence, brown mustard is so commercially viable. This particular species has been cultivated in the Orient for several centuries and an assortment of types has been developed that have edible leaves, seeds, roots and stems. In traditional folk medicine, brown mustards have been used in the form of a diuretic, stimulant, purgative and also to cure an assortment of diseases, counting neuralgia and peritonitis. Even in contemporary times, brown mustards are employed in mustard plasters to heal arthritis, rheumatism, aching back, chest congestion and aching muscles. In Chinese herbal medication, an infusion is prepared from the brown mustard leaves and it is employed to cure inflammations of the bladder as well as to stop bleeding. The seeds of brown mustard are used to heal abscesses, colds, bronchitis, toothache, rheumatism, stomach disorders and even ulcers. The brown mustard seed is considered to be a warming tonic herb having antibiotic actions. Brown mustard is considered to be aperitif, anodyne (a medication that alleviates pain), emetic, diuretic, stimulant and rubefacient and is a traditional medication for treating foot ache, arthritis, lumbago as well as rheumatism. In China, the brown mustard seed is employed in treating tumours. People in Korea use the brown mustard seeds in treating colds, abscesses, and rheumatism, lumbago and stomach problems. In Africa, the brown mustard root is employed in the form of a galactagogue (any medication that promotes the secretion of milk). Taking mustard internally may pass on a body smell that repels mosquitoes. In addition, brown mustard oil is employed in treating skin eruptions as well as ulcers. Brown mustard is thought to be a tonic and aperient and the volatile oil enclosed by brown mustard seeds is employed in the form of a counter-irritant and a tonic. In Java, the brown mustard plants are used in the form of an anti-syphilitic emmenagogue. The leaves of brown mustards are applied to the forehead and are believed to ease headache. Besides therapeutic utilities, brown mustards also have a wide variety of culinary uses. Brown mustard leaves are used to add flavour and spice to salads and stir-fry dishes. Even the brown mustard flowers are edible and you may cook fresh mustard flowers for about three minutes in salted boiling water. Subsequently, drain the liquid and allow the flowers to stand a couple of minutes. Serve the boiled flowers with butter. You may also use brown mustard flowers to prepare a delicious edible garnish. You may add whole seeds of brown mustard in pickles, curries, relishes, sauces as well as to add essence to pot roasts and additional meats, for instance rabbit, lamb and pork. In addition, brown mustard seeds are a must in sauerkraut and while cooking potently flavoured vegetables, for instance cabbage. Pulverize the seeds to form the base of ready-made mustard or mustard paste. You may use a food processor or a mortar and pestle or put the seeds between two sheets of paper and pulverize them using a bottle. Pounded mustard seeds keep for an indefinite period. In fact, brown mustard seeds are extensively and commercially used in preparing powdered mustard, pickling spice blends and also in prepared mustards that vary from the omnipresent vivid yellow seasoning, which is indispensible for the fast-food industry to the deliciously assorted herb-flavoured and wine-flavoured mustards much-loved by gastronomes. Brown mustard leaves possess a spicy essence that may vary from mild to hot - in fact, mustard leaves are among the most exceedingly valued cooked vegetables in the Orient. In addition, brown mustard leaves may also be consumed raw - they need to be shredded delicately to be an extremely suitable addition to mixed salads. It may be noted here that the leaves yield a protein that blends extremely well with banana pulp and is suitably accustomed in the form of a filling for pies. The flowers as well as the tender flowering stems of brown mustard too may be consumed raw or cooked. They are sweet to taste and juicy. In addition, edible partly drying oil is also derived from the brown mustard seeds, which enclose about 25 per cent to 30 per cent oil. The seeds are also used in the form of a mustard seasoning. In effect, it is the basis for ‘brown mustard' - prepared mustard which has a comparatively mild flavour than those of the other species of mustard. Use of brown mustard may result in a number of side effects. For instance, mustard plasters generate considerable heat, which may burn the skin. Therefore, it is advisable that you remove mustard plasters 15 minutes after application. In addition, extended application of mustard plaster may cause burns to the skin as well as damage the nerves. Emissions from a mustard plaster may lead to sneezing, coughing, and irritation of the eyes and also cause asthmatic attacks. Never apply mustard plaster to children who are below the age of six years or to people who are enduring kidney problems. Brown mustards may probably cause allergic reactions in children as well as teenagers.